I love to travel. This year I'm late in organising my holiday. 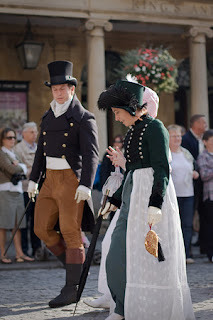 From the wonderful site The Jane Austen Centre (photo from the site) I mentioned earlier this week, I discovered the Jane Austen Festival in Bath, UK in September 2009. I'm very tempted to go. I would most likely stand and drool, I mean, watch him. I can totally see your wide eyes, Helen! Ask him his secret for picking up women. Nevermind. I think I know. Are you kidding? I'd probaby yawn if he walked by me, (no disrespect to him) but I think that's a good thing, right? Stephen, you can check out previous posts for Mr. Darcy's pick up lines. Galen, maybe your wife will not yawn. Marvin, Darcy covered with chocolate will be a great dessert. Galen, She's got you there. Ball's in your court. Rebuttal?